Are strong opening sales of the Z10 in the UK indicators of global success? 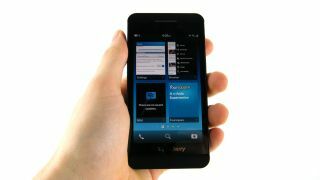 We were moderately impressed in our BlackBerry Z10 review, but consumers seem more taken with it. The smartphone is off to a flying start in the UK, according to analysts who are reporting sell-outs in several Carphone Warehouse locations. , Jefferies analyst Peter Misek has also points to O2, Vodafone, Orange, and EE stores, who are claiming strong opening sales for the new BlackBerry 10 powered handset. All up, Misek is speculating that this could equate to several hundred thousand Z10 sales in the first few days on shelves. Pre-orders in Canada are also noteworthy, with Misek reporting that the initial sales of the Z10 on BlackBerry's home soil could approach 100,000. Last roll of the dice? This is great news for BlackBerry with several weeks still before the phone launches in the US; a former stronghold for BlackBerry products and services, and a market significantly larger than that in the UK and Canada. Z10 handsets are expected in North America, Australia and parts of Asia at the beginning of March. The launch of the BlackBerry 10 OS and the Z10 handset have been called BlackBerry's last chance to reenter the ever-shifting smartphone and mobile computing market, following several years of dwindling sales and plummeting share prices. The Z10 is a full-touchscreen phone designed as a direct response to the handsets that challenged the dominance of the BlackBerry brand in recent times, like Apple's iPhone. BlackBerry will also release a more familiar design with the QWERTY keyboard packing Q10, expected in April.